Today I’m loving …. 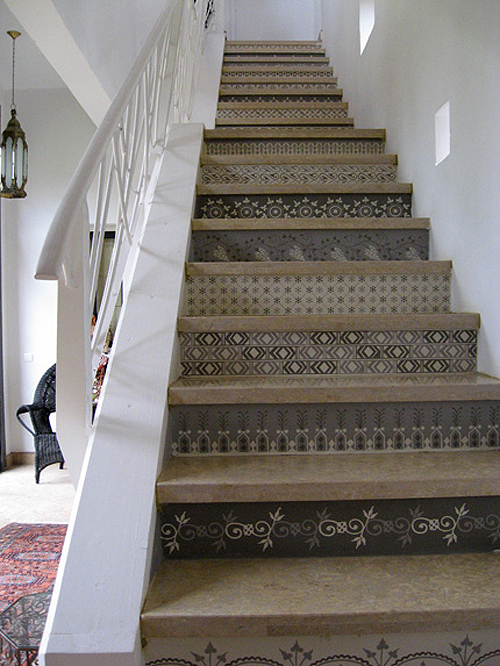 these staircases with stencils from the Moroccan stencil collection at Royal Design Studio. These stencils are Fantastic!! Wish I had stairs! Hello Danielle! Thank you reposting this awesome project using our stencils. The yellow stairs were done by the talented Carol Leonesio in New York. The neutral colored stairs below were designed for, and done on site at Peacock Pavilions in Marrakech, Morocco. I have taken several groups of painters there and this was a project done on one of our first trips. I definitely think painted decoration (which is so easy!) makes climbing the stair infinitely more fun!! These staircases are absolutely gorgeous!! So unique. Oh I want a staircase! Love these! This is a really inspiring way to inject interest into an otherwise dull space. I love the juxtaposition of all the different patterns, which work so beautifully together! Definitely love them both but would prefer the gray one if we had a staircase. wow, beautiful, i love the yellow ones, it actually reminds me of a place i stayed in morocco. All are beautifully done but my fave is the yellow one. Wonderful art. Yes I think these great, do you have a rough pricing? Do the designs come in a set like this? I did look at your link and think maybe they are indiv priced, if so is there a way to get the effects shown here reasonably costed? Actually, we have both of these staircases in my house. 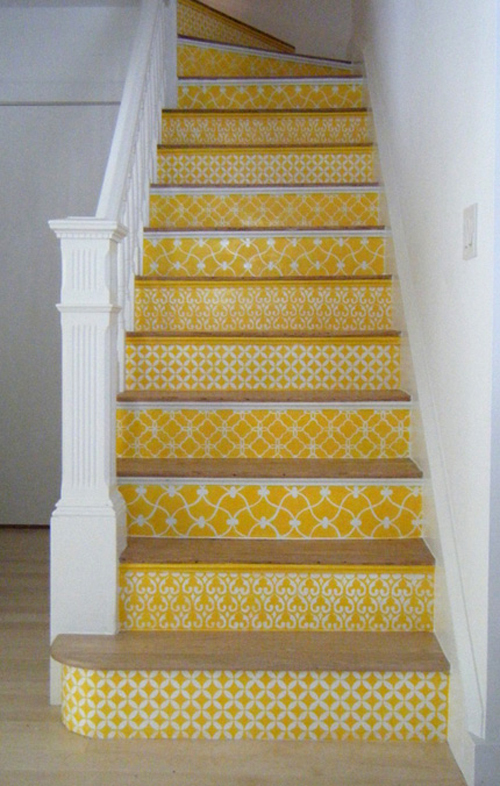 The stencils for the yellow staircase were originally made by Melanie Royals for my own house and we did them in a soft black and ivory running up our staircase. Then of course we have the second one — the photo you have is not very clear — the staircase is actually all in varying shades of taupe and grey. Wow… the yellow staircase looks great! Love how each stair has a different pattern. Danielle, love your blogg and shop. I was so happy to see the photo of the yellow stairs done by my friend Carol in Cambridge Ma. Carol is known as PainterGirl, and she too has a great blog. Thanks for sharing. I love these stair designs. Is there some top coat applied to keep them from getting hopelessly scuffed? How can I buy these stencils? Where can I find instructions and stencils for this? could you achieve a similar result using wallpaper as I don’t think my stenciling skills are up to this?